One of my interesting jobs at Low End Mac is compiling our price trackers, which have evolved quite a bit over the years. We do price trackers for all Macs that are supported by some version of Mac OS X, from Beige G3 Power Macs and WallStreet PowerBooks through today’s Intel-based Macs. We also track the price of memory upgrades for these Macs, and we recently added estimated shipping costs (based on our location in Michigan). To round things out, we also track prices for the Classic Mac OS, earlier versions of OS X, and OS X 10.5 Leopard. And Time Machine and AirPort hardware and Apple TV and iPods. Anyhow, I’ve noticed that for some older Macs, shipping can cost more than the computer. That raises the question, Is it worth it? What Can You Do with a G3 iMac? Before we look at hardware, let’s look at possibilities. The iMac brought back the all-in-one design pioneered in Apple’s Lisa and the original Macintosh. All you need is a power cord and an Internet connection, and you’re good to go. Two cables. An old iMac can make a nice home or small office server. Drop in a big hard drive (up to 128 GB) or put a really big FireWire hard drive on ones with FireWire ports, and you’ve got a machine with plenty of power to serve up files to several users. You could even enable Apache (Personal Web Sharing) and create your own web server. You can use it as a jukebox with iTunes. The built-in stereo speakers are of passable quality, and with the right cable you can connect it to your home stereo. It might even be a nice machine for ripping CDs and tapes using Audacity, although I find it sluggish on my 400 MHz iMac. This could be a nice kitchen computer – store your recipes, do your grocery list, use Quicken, set up an instant messaging client, etc. You really can’t beat a G3 Mac with the Classic Mac OS and ClarisWorks for writing and number crunching – and AppleWorks runs decently on G3 Macs with OS X as well. CPU speed will be a big factor for the Internet. Things like Flash and QuickTime can be very demanding; for that, you’ll want a faster G3 system – or a G4 if you can afford it. Slow Internet video can be a plus if you’re setting this up as a homework machine – less distractions! Be aware of the limitations of the built-in display, which tops out at 1024 x 768. That seemed like a lot back in the day, but even the entry-level MacBook has a higher resolution screen. You’ve got lots of options with old iMacs, and prices for all but the 700 MHz model have become very reasonable. Apple introduced the first iMac in May 1998, although it didn’t offer it for sale until August 15. In its day, the 233 MHz iMac was something of a powerhouse with the same 233 MHz G3 CPU introduced with the first beige Power Mac G3 in November 1997. There were four versions of the original iMac design. Revision A models have a 233 MHz CPU on a 66 MHz bus. Base memory was 32 MB, and Apple officially supported a 192 MB configuration. This iMac used a slow, inexpensive 4 GB IDE hard drive and supports drives up to 128 GB in size. ATI Rage IIc graphics with 2 MB of RAM (expandable to 6 MB) was built in, as were stereo speakers, a microphone, a 24x CD-ROM drive, two USB 1.1 ports, ethernet, a 56k modem, IrDA, and a 15″ CRT display. The original iMac came in Bondi blue, and the built-in screen could display resolutions from 648 x 480 to 1024 x 768, although it tends to be a bit soft at the highest resolution. Setting video to 800 x 600 is a good compromise between resolution and a crisp display. The Revision B iMac, released two months later, was almost identical, but it made 6 MB of video RAM standard and ATI Rage Pro graphics. Apple moved to a 266 MHz CPU and five “fruity” colors with the Revision C iMac, which was unveiled at the January 1999 Macworld Expo. Bondi blue was replaced by blueberry, cherry, lime, tangerine, and grape, a 6 GB hard drive was standard, and Apple used ATI Rage Pro Turbo graphics, still with 6 MB of video memory. Infrared (IrDA) support was no longer included. 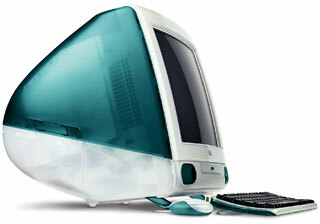 The fastest iMac to use the original design was the 333 MHz Revision D model, rolled out four months after the Rev. C. The only significant difference between Revisions C and D is CPU speed. The biggest drawbacks are a slow Level 2 (L2) backside cache, which runs at 40% of CPU speed, and issues with hard drives over 8 GB in size. To avoid potential problems with both the Classic Mac OS and Mac OS X, the first partition must be smaller than 8 GB (we suggest 7 GB to play it safe), and the OS must be on that partition. The biggest performance upgrade comes from adding RAM, and users have discovered that Apple was very conservative in only officially supporting up to 192 MB. Bill Brown, who supports a lot of old Macs, reports the as long as you’re sure to use CL2 memory, these iMacs can support 256 MB modules and can even work with 512 MB ones, although they are quite expensive. RAM isn’t cheap for these iMacs, but it’s not unreasonable. A 128 MB module goes for about $10 these days, 256 MB for $24, and 512 MB for $50 – more than the computer itself is worth. Also, when upgrading RAM, one of the two modules must be low profile memory. Pros: Runs Mac OS 8.5.1 through OS X 10.4 Tiger (officially supported to 10.3 Panther, and earliest versions also support Mac OS 8.1). Built-in 15″ CRT display. Easily supports 512 MB of RAM. Uses standard IDE hard drives. 10/100 ethernet. Built-in modem. 2 USB 1.1 ports. Okay built-in mic and stereo speakers. Cons: Issues with boot partitions over 8 GB capacity. Internal EIDE bus limited to 128 GB hard drives. Slow 16.7 MBps drive bus. Outdated ATI Rage GPUs really struggle with OS X. USB is version 1.1, slow by modern standards. No FireWire. No AirPort support, as they predate AirPort. No expansion slots. Best bet upgrades include upgrading RAM and putting in a faster EIDE hard drive (5400 rpm is good), especially if you already have one pulled when upgrading another computer. As Classic Mac OS computers, the tray-loading iMacs are a good performers. The ATI Rage video is fine, and even 256 MB of RAM is plenty. As Mac OS X computers, the tray-loading iMacs are going to feel sluggish. A fast hard drive and lots of RAM will help. Look for the 333 MHz model, which has the fastest CPU and best graphics processor. The crippling factors are the ATI Rage Pro video and the slow EIDE bus. I would not invest in a new copy of OS X for a tray-loading iMac, but it’s a good place to use an old copy from a Mac you’ve alredy updated to a newer version. There are third-party USB WiFi dongles in the $25-30 price range that will let you use wireless networking with these old iMacs and Mac OS X 10.3 or later. Conclusion: Although they can run Mac OS X, they are far from ideal. The slightly fuzzy display at 1024 x 768 is a drawback. But if you’re looking for a low cost Mac for light use, this could be the cheapest way to go. I’d peg value at no more than $20 with mouse and keyboard in a stock configuration, double that with a significant RAM upgrade and a larger hard drive. At $30 or more for shipping, I would recommend against buying these online, and you’ll find very few online dealers even list them any longer. Craigslist is a good option. Apple overhauled the iMac design, releasing the first slot-loading iMacs in October 1999. Speeds would range from 350 MHz to 700 MHz over the life of the design, and all of the slot-loaders support up to 1 GB of RAM on a 100 MHz system bus. There is no 8 GB partition issue with the slot-loaders, which support Ultra ATA drives to 128 GB. Except for the 350 MHz models, all of these have two FireWire 400 ports and support AirPort wireless networking, although that requires both an AirPort Card and an AirPort Card Adapter. For WiFi, we recommend one of the third-party USB dongles – prices start at $25. Apple used different versions of the G3 CPU and different ATI graphics processors over the years. The entry-level model always had a CD-ROM drive, and other models may have included DVD-ROM or CD-RW drives. Apple never offered a Combo drive, let alone a SuperDrive, although third-party upgrades are available. The slot-load iMacs are a bit smaller and lighter than the tray-loaders, and the built-in 15″ display tends to be quite crisp as 1024 x 768 resolution, a real plus over Rev. A-D iMacs. Finally, there’s no cooling fan, so these run quietly in comparison to most desktop computers. The first family of slot-loading iMacs included a blueberry 350 MHz CD-ROM version with 64 MB of RAM and a 6 GB hard drive. The middle model ran at 400 MHz, had a 4x DVD-ROM drive, added FireWire and AirPort support, and included a 10 GB hard drive. It was available in the same colors as the Rev. C and Rev. D iMacs. The top-end iMac had 128 MB of RAM, a 13 GB hard drive, and came in graphite gray. All of these have a 512 KB L2 backside cache running at 40% of CPU speed and use ATI Rage 128 VR graphics with 8 MB of video memory and a 2x AGP bus. Apple really boosted the iMac’s top speed with the July 2000 family, which topped out at 500 MHz. Graphics were better with ATI Rage Pro 128 graphics, and a new range of colors was introduced. The 350 MHz iMac came in indigo and had a 7 GB hard drive. That and the better graphics give it a small edge over the blueberry model it replaced. 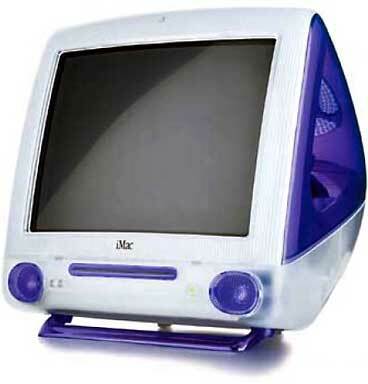 One step up was the 400 MHz iMac, which had a 24x CD-ROM drive and 10 GB hard drive, and was available in indigo or ruby. The 450 MHz iMac included a 4x DVD-ROM drive and a 20 GB hard drive, and it was also available in sage. At the top was the 500 MHz iMac in snow or graphite with 128 MB of RAM and a 30 GB hard drive. Apple had zigged while the rest of the industry zagged. Usually a leader, Apple had embraced DVD-ROM drives at the same time the Windows world was going wild for CD burners. Apple remedied that with the February 2001 iMac family, which is also known for the most unexpected color schemes ever to come from Apple. The entry-level iMac was now a 400 MHz model with 64 MB of RAM and a 10 GB hard drive. Like the rest of the family, it included ATI Rage Ultra 128 graphics with 16 MB of video memory, the most ever in an iMac to that date. In the middle were two different 500 MHz iMacs, one for the North American market and one for the international market. The 400 MHz model and International model used the same backside L2 cache running at 40% of CPU speed as earlier iMacs, but the North American 500 MHz iMac and top-end 600 MHz iMac used the new PowerPC 750CXe CPU, which has a smaller L2 cache that ran at full CPU speed. The 500 MHz and 600 MHz models included an 8x CD-RW drive. As we already hinted, Apple had the most unexpected colors ever with this family – the 500 MHz and 600 MHz models could be ordered in Flower Power or Blue Dalmatian in addition to more traditional colors. The G3 iMac reached its zenith with the July 2001 family, which reached a top speed of 700 MHz. This time around, all the models had the on-chip L2 cache. The low end of the line was a 500 MHz CD-ROM model with a 20 GB hard drive. In the middle was a 600 MHz CD-RW model with 128 MB of RAM and a 40 GB hard drive. At the top was a 700 MHz CD-RW iMac with 256 MB of RAM and a 60 GB hard drive. Prices cover quite a range, as do CPU speeds and features. I’ve seen 400 MHz CD-ROM iMacs go for $20 on the local Craigslist, and dealers may charge well over $300 for the ultimate G3 iMac – the 700 MHz. I have hands-on experience with 400-500 MHz models; my comments on faster ones extrapolate from that. Pros: Run Mac OS 8.6 through 10.4. Support up to 1 GB of RAM. Two FireWire 400 ports on 400 MHz and faster models. 100 MHz bus. Faster drive bus than tray-load iMacs, no 8 GB partition issue (although with the same 128 GB limitation). Comfortably handles 7200 rpm drives. Some have DVD-ROM, which facilitates installing Mac OS X 10.4 Tiger. Cons: AirPort requires both an AirPort Card and an AirPort Card Adapter. 128 GB maximum for Ultra ATA hard drives. USB 1.1 is slow – still only 2 USB ports. Optical drive upgrades tend to be expensive. No FireWire or AirPort support for 350 MHz iMacs. Best bet upgrades include topping out RAM and putting in a 7200 rpm hard drive. The graphics processor gets better with every generation except the last. As a Classic Mac OS computer, the slot-load iMacs are solid performers. The ATI Rage graphics support 1024 x 768 resolution, which is usually quite crisp on the built-in display. The faster memory bus, faster ATA bus, and built-in FireWire ports give you lots of options. As a Mac OS X computer, the slot-load iMacs can be good performers thanks to a faster memory bus, a higher RAM ceiling, and a faster IDE bus – but in most cases you’ll want to upgrade both RAM and hard drive speed. Memory is much more affordable than on the tray-load iMac – $6 for a 64 MB module, $9 for 128 MB, $12 for 256 MB, and $24 for 512 MB – so about half as costly for the bigger modules. There’s quite a range of CPU speeds here, and I’ve worked with 233 MHz G3 Macs as well as 600 MHz ones. There’s a big performance difference, and I’d only recommend the ones below 500 MHz for lightweight tasks if you want to use OS X – word processing, email, basic work on the Web. The 400 MHz iMac can handle YouTube and Facebook, but it’s obviously straining to do it. A 600 MHz or 700 MHz iMac would handle things more comfortably. The ratio of computer value to the cost of memory upgrade and/or shipping is far better than with the tray-load iMacs. I wouldn’t hesitate to put 512 MB in 450 MHz or faster slot-loader, and replacing hard drives is far easier than on the original iMacs. Conclusion: These iMacs handle Mac OS X 10.3 pretty comfortably as long as they have at least 128 MB of RAM, and they handle Tiger decently with 256 MB, although these versions of OS X will run much better with twice that much RAM (hint: disable Spotlight and Dashboard to reduced the RAM footprint of Tiger by about 30 MB and free up CPU cycles). Shipping is still a big factor, but at least it isn’t more than the cost of the computer itself. Local deals generally make the most sense. Buying from a dealer usually means the machine has been inspected and tested and includes a 60- or 90-day warranty. It can also mean $35 or more in shipping costs, so it makes sense to look locally. There is a bit more risk buying privately, and Craigslist is a great tool for finding local sellers. Sellers tend to list on the high side, remembering what they originally paid, but you should be able to use our price trackers to show them what dealers are charging with a store warranty. That said, Craigslist prices vary widely from region to region. And eBay, being an auction site, tends to command higher prices, so it’s not the first place I’d look. In general, I can’t recommend a G3 iMac unless you’re getting a real bargain and not meant for heavy duty work. The G3 Mac market is on its last legs, because there just isn’t much money to be made selling $25-50 computers. Most G3 models can run Tiger, which provides access to fairly current browsers, and those that can’t run Tiger can run Mac OS X 10.3 Panther, which is competent but dated. If you still have a Classic Mac OS workflow, however, even a G3 is plenty powerful – the big drawback there being no real options in an up-to-date browser. G3s can be great for writing, basic spreadsheet work, email clients, and basic image editing. Where they show their age is things like Flash on the Internet. Sites such as YouTube take everything a low-end G3 iMac (233 MHz to 450 MHz) has to offer. Living with low-end Macs is something of an art. You want to use a computer that’s comfortably adequate for your tasks and avoid unnecessary and expensive upgrades. It’s a simple fact of life that any version of Mac OS X is far more demanding of hardware than any version of the Classic Mac OS. It’s equally a fact of life that the most up-to-date software is generally available only for recent versions of the Mac OS. It’s something of a balancing act, and in general Tiger is optimized to the point that it will run better on a low-end G3 iMac with sufficient RAM (at least 512 MB, and more if you can afford it) than Panther. You can view YouTube videos on a 400 MHz iMac, but they’ll be choppy. If you’ve already got an old G3 iMac, by all means try to get the most out of it at minimal expense, but if you’re picking up a secondhand iMac, go for the 500 MHz and faster ones. Invest in some RAM, use that spare copy of Panther or Tiger you have (I like to buy the 5-user family edition, since I have so many Macs). Have realistic expectations, and you may find happiness with your G3 iMac for years to come.